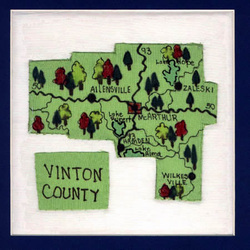 The Vinton County RTA was organized in August of 1966. That same year the Allensville, Hamden, McArthur, Wilkesville, and Zaleski schools were consolidated into the county-wide Vinton County School System. Now all of our members have taught for the same school system. Promote fellowship among the retired teachers of Vinton Co.
Promote the economic and professional welfare of teachers. Sponsor and support such legislation in Ohio which shall contribute to the comfort and welfare of teachers. Vinton Co. RTA has 24 members. The chapter meets four times a year at the Community Building in McArthur. Vinton County is very rural and very scenic. We have state parks, covered bridges, quilt barns, iron furnaces and a haunted tunnel. Everyone is welcome to join our group.